What strikes me first is how much the publishing process has changed since 2012, when my last book was published. Granted, that was with a mainstream publisher (Bloomsbury USA Children’s), with all the support and systems in place an author could expect. What I’m saying is how many more variables there are out there, and how crowded the field. And how working with a small press makes the publishing trials and tribulations—and the publishing thrills—that much more apparent. Being involved step-by-step with my lovely publisher, Bellastoria Press, I see the process in all its glory. I’m completely aware when the cover is not what was expected (glossy vs. matte), for instance. I’m biting my nails when it’s taking longer than I thought to get those first copies to send to reviewers and bloggers. But these are very small things. I don’t think I ever gave much thought to the behemoth that is Amazon before this. Or rather, I was a consumer without realizing that with great size comes great capacity to mess things up. Although it’s fixed now, the paperback version of my book originally appeared with a frilly pink blouse as its image. Several days, many phone calls, and me submitting error reports later, we have the cover of my book. But that wasn’t the limit of my experience with them. It seems that on Amazon UK and Amazon Canada the right image displays, but with the description of that same frilly pink blouse. We’re still trying to sort that one out. Holding the printed book in my hands. Sending it off into the world for bloggers and reviewers. Seeing how excited people out there are to get their hands on it, and the excitement generated by bloggers like Stacie Kent, who took the lovely photo of my book at the top of this post. Knowing my local bookstore will carry it. Being grateful for the support and encouragement of my fellow historical novelists. The feeling that yes, I can do it. I’m fortunate, I work so hard, and I’m always learning and developing, and I put my everything into every book I write. Special thanks go out to Amy Bruno and her Historical Fiction Virtual Book Tours, and to the Historical Fiction Authors Co-op. The first review comes on May 13. Gulp. TWO WEEKS TO PUBLICATION! April 22! 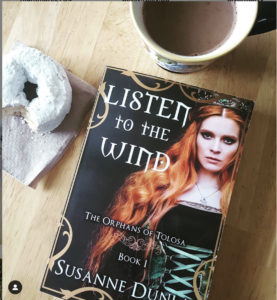 Previous: Listen to the Wind blog tour!